A powerful addition to your listing marketing (and seller prospecting) toolkit is now available in the RealBird member area: Lead capture landing pages are now automatically created for your listings and you can use them for Coming Soon, Just Listed, general For Sale and For Rent, Open House and Hot Property social media campaigns. These are mobile-friendly “squeeze” pages that can dramatically improve your conversion rate of Facebook ads and you can of course use them in any type of social media campaigns. Facebook Advertisement landing pages: For Sale, For Rent, Just Listed, Coming Soon, Open House, Recently Repriced, Hot Property etc. 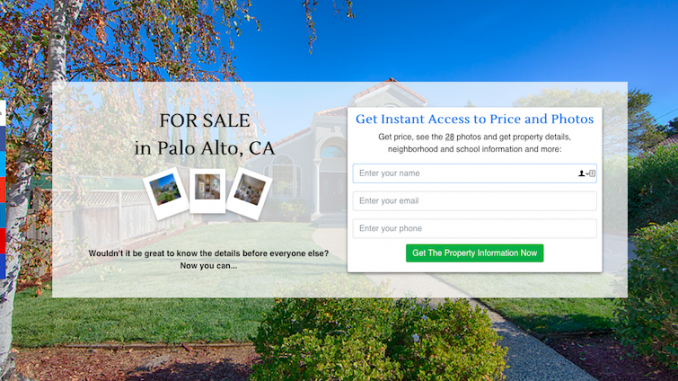 As an example, here is a landing page for a luxury home for sale in Palo Alto, CA courtesy of Juliana Lee of Keller Williams in Palo Alto. Click the photo below to see a live example. To get started, just log into RealBird (or register here) and find the landing pages on your list of listings page or after you published a new one. We hope you like this new marketing tool. We’ll have much more coming soon, including ability to customize the landing pages with your own text and Facebook advertising templates for best results and many many more features.